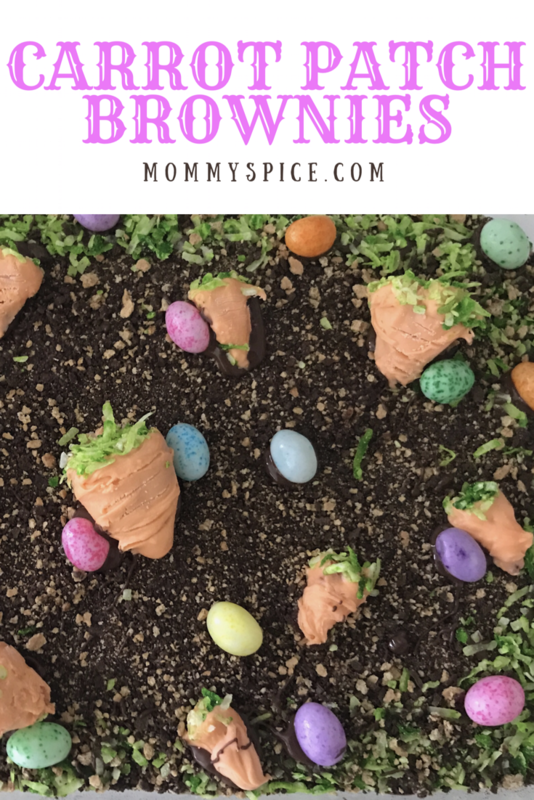 Get ready for the cutest Easter dessert ever! These have become a really cute tradition in our house, the kids love to help decorate them too. To keep things easy just use your favorite brownie mix and cook it according to package instructions. These brownies are really all about the toppings anyway! 1 box of your favorite brownie mix, cooked per package instructions in a 9×13 pan. Then cooled completely. Now bare with me guys this one does take a little time to all come together. Once your brownies are cooked and cooled, set them aside. Wash strawberries and remove the greens at the top, then dry them. Start by melting half of your white chocolate in the microwave, or double broiler, until smooth. Add in your green food coloring and stir to combine. Combine green chocolate with coconut in a separate glass bowl, use a spatula to combine. This is going to be your “grass” it will appear more marbled than completely green, that’s ok. Set aside your bowl of green coconut and melt remaining white chocolate, this time adding in your orange food coloring when smooth. Now it’s time to make our carrots. Taking your strawberries one at a time, dip them into the orange chocolate, you may need to swirl them around to coat them completely. While the chocolate has not yet set, take a pinch of your “grass” and top your “carrot” you may need to apply a little pressure to get the coconut to stick. Now if you really want to overachieve, take a metal fork or toothpick and scrap the prongs along the sides of the strawberries gently, to make lines on your carrots. 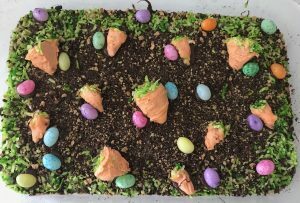 Once all of your carrots are complete set them aside, on wax paper to set. This next part is my kids favorite, put your graham crackers into a zip top bag and crush them up. You can use a rolling pin if you’d like, however my kids love to smash them with their hands. Using graham cracker crumbs is another option, but that takes out any smashing fun to be had. This will be your “dirt”. Now we’re almost there guys! Last step is to melt your semi sweet chocolate, this is going to act as your glue so that your carrot patch stays all together. I like to start from the outskirts and move my way in. That being said, spread a small layer of melted semi sweet chocolate on the perimeter of your brownies, working quickly, sprinkle on some dirt and some grass. 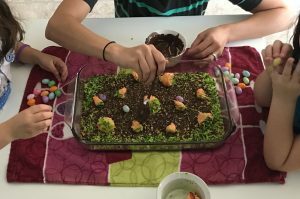 I like to dip the back side of my carrots, and “Easter eggs” (jellybeans) in the melted semi sweet chocolate then place them around the center of the brownies. Add just enough melted semi sweet chocolate to make everything stick, if you have any left over after decorating feel free to spread that to any empty spaces you may have and add extra dirt or grass. These do take a good bit of time and have quite a few steps, however, it’s also an activity for the kids which is nice. Plus if you have a family get together, church or Easter pot luck these will be a total hit. Almost too cute to cut into, except they’re too yummy not to! I have a few little tips for these brownies, 1 keep them in your glass baking dish! You could line it with parchments paper and take the brownies out to decorate however you will then need more coconut to decorate the sides of the brownies. If you leave them in the baking dish everything is a little more contained and easier to transport too! Tip number 2, when it comes time to make your orange carrot coating I suggest using the gel food coloring, they actually have an orange so you won’t be trying to make an orange color yourself with your traditional 4 food color droppers, talk about a time saver! Tip number 3, go wild with these! You could add a chocolate bunny or two or some peeps, have fun with this one, the easer bunny will approve!